Demi Lovato's life is "so good" now and took to Twitter to celebrate the third anniversary of her album Unbroken, which was released shortly after she left rehab in early 2011. 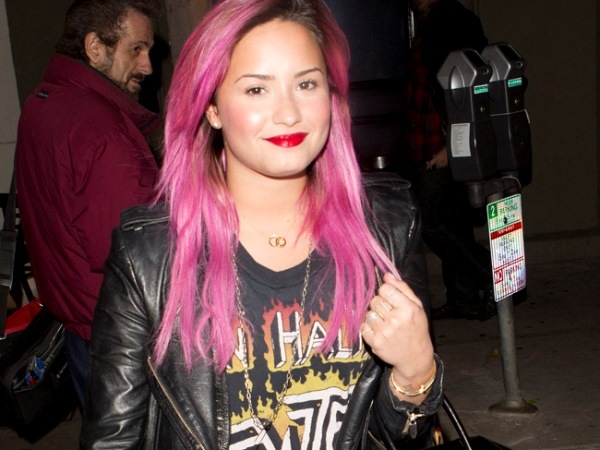 Demi Lovato's life is "so good" now. The Heart Attack hitmaker, who quit her tour to seek help in rehab for an eating disorder and self-harming in December 2010, took to Twitter to celebrate the third anniversary of her album Unbroken, which was released shortly after she left her treatment facility, and thanked her fans for giving her a reason to live. The 21-year-old star tweeted on Tuesday: "Life is SO GOOD!!!!!!!!!!! YAYYY!!!! "Happy Lovatic Day.... I'm alive because of you all. Thank you.... I love you all so much.. #3YearsUnbroken (sic)"
The Skyscraper singer also used the opportunity to urge any of her followers, who may be struggling with similar issues, to seek help. She wrote: "You CAN turn your life around. You can go through hell AND BACK. It IS possible. NEVER underestimate yourself. I BELIEVE IN YOU." Earlier this week, the former The X Factor USA judge revealed she has never felt better. She tweeted: "It's a great feeling knowing how to balance things in life. Feeling stronger and better than ever... #2014"
Demi previously admitted her problems stemmed from insecurity and credited her fans for helping her get through them. She said "[I was] looking in the mirror and never feeling good enough. I felt like I was living a lie... I was dealing with all this pain, emotionally. And I felt guilt and shame. I decided to take it out on myself. I harmed myself." She added: "Every time someone asks me for a picture or an autograph, even if I'm having a bad day and I'm in a bad mood, I remember, 'You're nothing without this person'. They make it special."